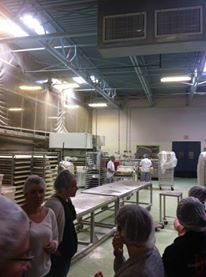 Iggys Bread of the World: An Inside Look! 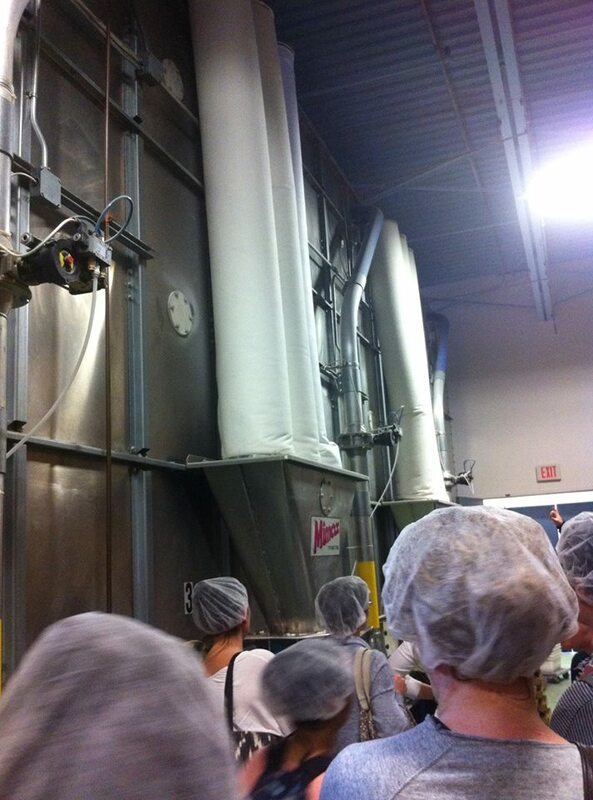 Flour is super cool because every couple of months, a field trip is scheduled for anyone who’s interested. This time around, we were visiting the official site of Iggy’s Bread of the World. Iggy’s Bread is sold ALLLLLLL over New England. I’ve seen their bread at a bunch of liquor stores, Whole Foods, open air markets, and more. Their bread is always fresh and looks soo good, so therefore I was pretty pumped about getting to visit their production site! 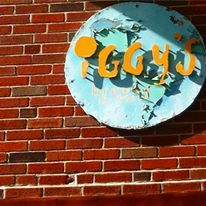 Iggy’s was started 17 years ago in a small bakeshop, only 3,000 square feet where they produced and sold bread at the same location. They really focus on the quality of ingredients and where they’re sourced from, trying to maintain the wholesomeness of the bread baking process. Currently, their production site and storefront is at 130 Fawcett Street, Cambridge MA where they have a 30,000 square foot facility to accommodate their continual rising popularity! Upon arrival, we got a good glace at the front of house operation- a tiny storefront but still busy with customers coming in and out. Soon after we were shuttled to their back offices to begin our tour. Hair nets donned, we headed to their packaging room. Every day, that packaging room gets BUSY. 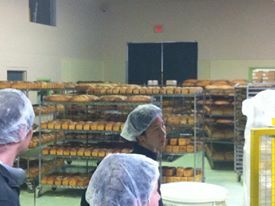 Workers are quickly assembling, filling, labeling and organizing the boxes of bread getting them ready to send out for the morning delivery. They start the whole packaging process late at night as the first delivery leaves at 2am. 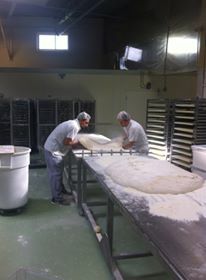 Iggy’s makes a promise to deliver the freshest bread which is why they’re a 24/7 365 bread bakery! Basically being in disbelief of how large their facility is, we entered their mixing room. As we passed through the doors, we passed their 3 silos full of flour. They then have an automated system where you can punch in how much flour you need which then dispenses the flour into another room. SO COOL! That machine also transports water and can change it’s temperature to accommodate different types of bread. Bread is only made four ingredients for the most part: Water, flour, yeast and salt. These four ingredients are then manipulated in different amounts and times of proofing all to produce different flavors and textures making bread a truly complex process. 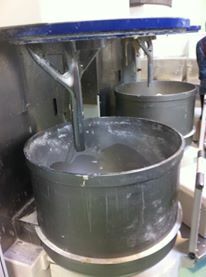 The mixing room was temperature controlled so all the bread proofed at the same rate consistently. Alongside the automated dispensing machine were two HUGE mixers that had fork tongs. Usually bread is mixed with a dough hook (the spiral shaped hook) but apparently the fork tongs gently mix the dough to create a more tender crumb. Next we walked to the largest part of their factory. 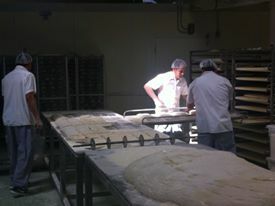 There were HUNDREDS of rolling racks filled with cooling loaves and rolls and workers shaping and loading loaves ready to be baked. It was so amazing to watch them work and be so in sync! Around the top of the room was a large conveyor belt. So listen up, this part is really cool. When the bread is ready to be taken out of the oven, a machine unloads these HUGE deck ovens and then lifts it up to the conveyor belt which then acts as a cooling system as it travels around the room. Once it makes a full circle, it can be loaded onto other racks for storage until packaging. They stick to fairly simple breads and never dabble in gluten free alternatives because it’s “irresponsible business practice” as our guide explained. It seems to me that they’re turning a huge profit so they’re able to really make their business focused on whatever they want! It was a really cool experience and I’m so lucky to have been able to have had the opportunity. While making bread isn’t really my passion in baking, I’m always looking for the next opportunity to learn and grow within my profession! I hope you enjoyed this post and a special glance into the food service world! Until next time!